Cook pasta as per packet instructions. In a frying pan sprayed with cooking spray, cook the bacon, spring onions and garlic for 5 minutes, stirring continuously. Add milk, parsley and half of the parmesan cheese to the frying pan, stirring continuously.... Check out our Bertolli Easy Chicken Carbonara recipe for a tasty treat! Creamy Bertolli Alfredo Sauce, crispy bacon, and peas make this dish the family favorite. 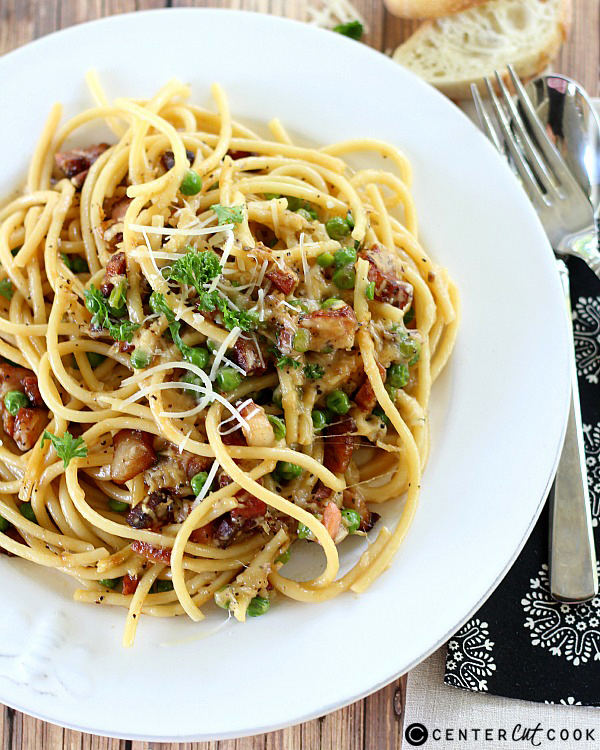 Creamy Bertolli Alfredo Sauce, crispy bacon, and peas make this dish the family favorite. Cook bacon in a large skillet over medium-high heat until evenly browned, about 10 minutes. Drain all but about 2 tablespoons bacon drippings from skillet. Cook and stir onion with bacon in reserved drippings until onion is translucent, 5 to 10 minutes. Add garlic; cook …... Transfer bacon into a large frying pan adding the minced garlic and frozen pre-cooked shrimp or prawns. Cook on medium heat for 5 minutes, stirring often until the bacon is golden and crisp. Cook on medium heat for 5 minutes, stirring often until the bacon is golden and crisp. Creamy Parmesan Carbonara Chicken is the ultimate twist! Crispy, golden chicken fillets in a carbonara inspired sauce for a new favourite chicken recipe! Crispy, golden chicken fillets in a carbonara inspired sauce for a new favourite chicken recipe!... Stir in Alfredo sauce, broth, peas, reserved pasta water, and pepper. Bring to boil. Bring to boil. Reduce heat to medium-low and cook until peas are tender, 10 minutes. It'sa easy as… Cooking 200g of dry pasta. Simply frying 150g of diced shortcut bacon in a pan until cooked, adding the DOLMIO Carbonara Pasta Sauce and simmering for 5 minutes. Bertolli Carbonara Sauce combines rich cream, aged Parmesan cheese, smoky bacon and garlic. 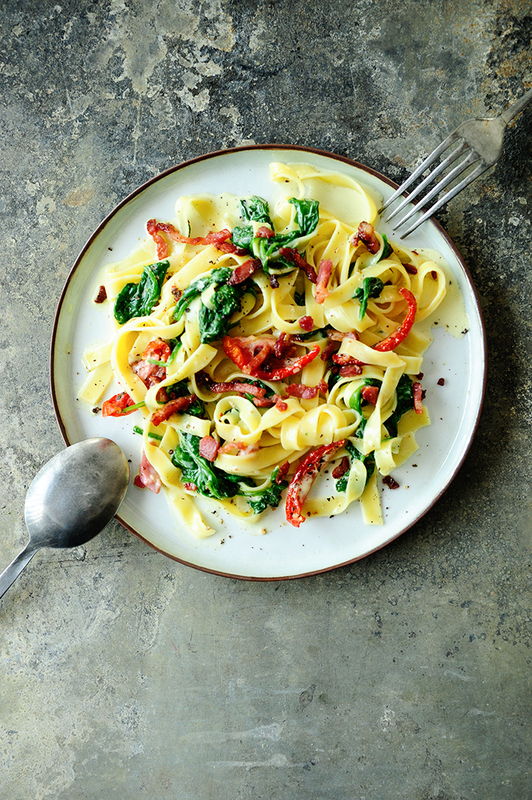 Treat yourself and cook up a delicious Carbonara pasta dish now! 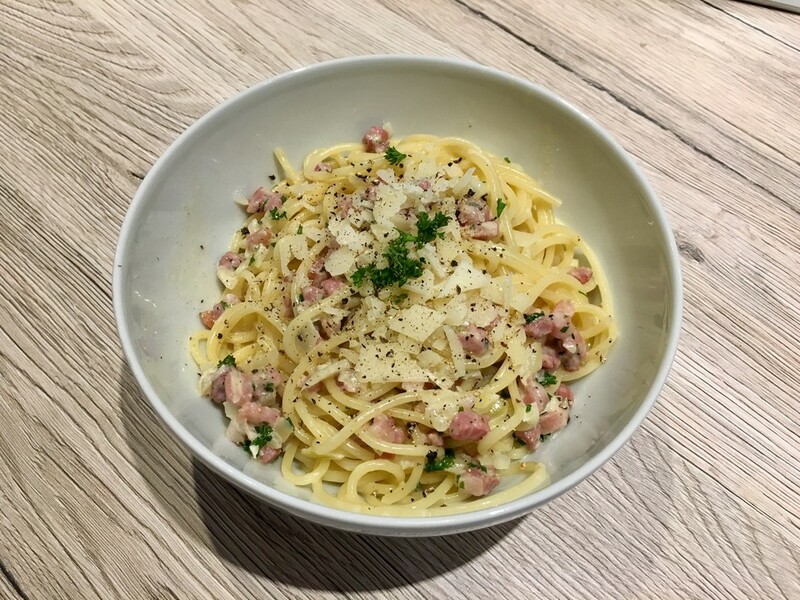 Treat yourself and cook up a delicious Carbonara pasta dish now! Cook pasta as per packet instructions. In a frying pan sprayed with cooking spray, cook the bacon, spring onions and garlic for 5 minutes, stirring continuously. Add milk, parsley and half of the parmesan cheese to the frying pan, stirring continuously.